Yesterday was National Chocolate Day, one of the greatest holidays ever invented (in my opinion) and the perfect day to unveil the October birthday cake of the month: Chocolate Cake De Luxe. I consider myself a pretty extreme chocoholic; it takes a lot for me to deem something “too chocolaty.” But I have to admit that this dessert truly lives up to its name and is one of the most decadent chocolate cakes I have ever tasted. 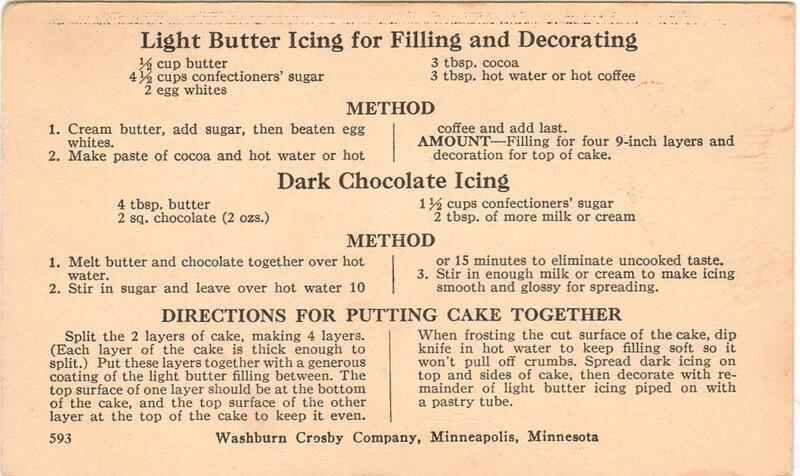 There are three different kinds of chocolate: the cake itself, the middle layer of frosting and the outside frosting. I completed the first two components with relative ease, but the outside frosting required a bit of patience and finesse. Of all the things I’ve attempted this year, surprisingly, frostings have given me the most trouble. The first batch was a bust. I was rushed and didn’t give the mixture the attention it needed. The second attempt was a success, but I had used all of my unsweetened baking chocolate squares in the first try so I had to improvise. Semisweet would have to do. It worked, but it also fell quite short of covering the entire cake. So I was on to my third batch. Again, I was running out of chocolate so I finished up what I had of the semisweet and also threw in some German baking chocolate. I, of course, tasted all three batches and was pleasantly surprised at how well the different chocolates worked together. They weren’t too sweet and the flavors blended instead of competing with each other. The next step: decoration. 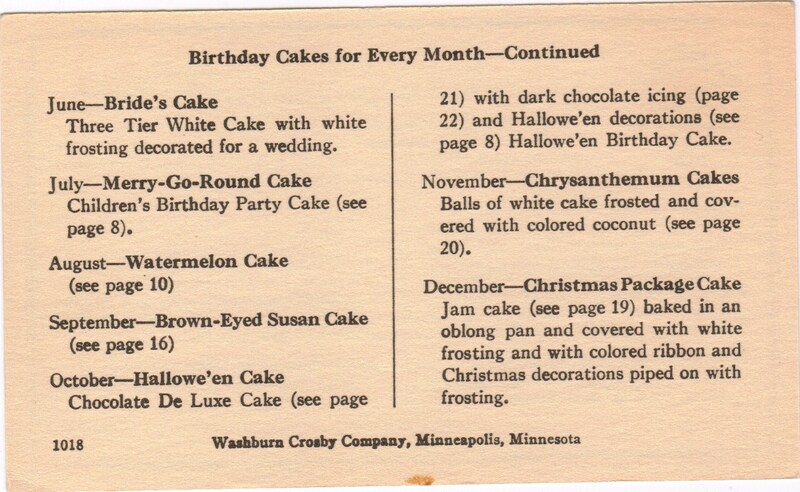 The New Party Cakes For All Occasions booklet offers several suggestions for Halloween decorations for this cake. I was running short on time, and after the struggle I had just to frost the cake, I decided to make the decorations simple. I opted for a single, large Jack-o-lantern on the top of the cake. 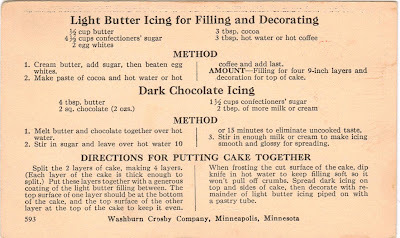 The recipe for this cake wasn’t printed in the New Party Cakes booklet; I’ve run into that problem with a few of the other monthly birthday cakes. But luckily I had a copy of the card in the box. It was one of the cakes I had considered making for my presentation to the Visual Journaling Collective at the Minnesota Center for Book Arts back in June. The coordinator of the group, Roz, is like me and is not only a huge fan of cake, but also of chocolate. As soon as I pulled the card out for the October birthday cake, I instantly thought of Roz. At our monthly Visual Journaling Collective meeting a few weeks ago, Roz talked about something that really resonated with me and hasn’t left my mind since her words touched my ears. We were discussing topics for our 2011 meetings and she mentioned that she wanted to provide opportunities for us to draw at every meeting. There were a few groans, and I have to admit, even my heart fluttered at bit at the thought, but she went on to explain why it was so important. Drawing, she said, causes us to pay more attention to the world around us. We are more present in the moment, notice little things we tend to overlook otherwise, and truly interact with our surroundings all through the power of observation. She went on to emphasize that skill level doesn’t matter, it’s the habit of continuing to put pen or pencil to paper that counts. Skill will be developed through practice. You just need to keep doing it. I thanked her for saying that after the meeting, it was something I really needed to hear. I’ve been creatively blocked for a while (something I will be writing about in my next post) and her words immediately implanted themselves in my heart. I always feel better when I’m creating – whether it is through art projects, writing or cooking – and this block has been truly frustrating. I thought back to Halloween of last year and remembered how I spent the evening. My husband was at the University of Minnesota football game, so Murphy and I were on our own to hand out candy to trick-or-treaters. 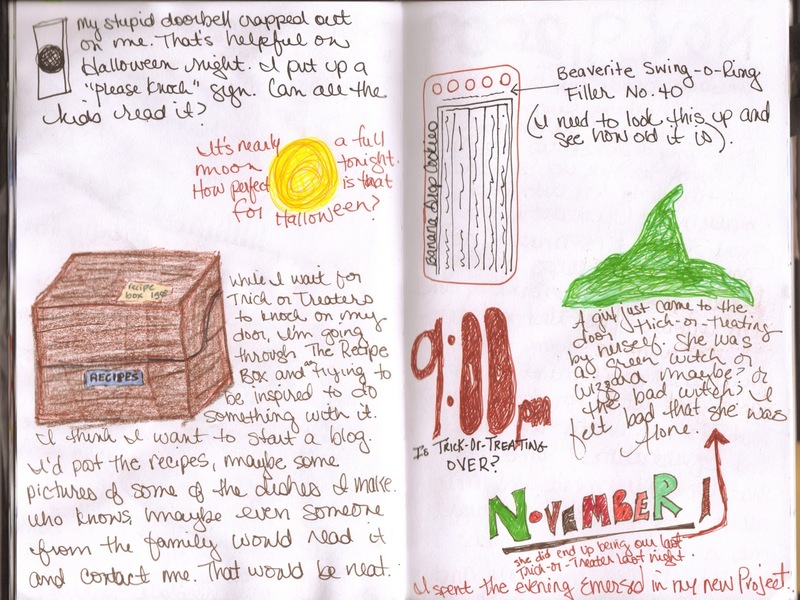 While I waited between doorbell rings, I sat at the kitchen table with The Found Recipe Box and a journal. I hadn’t started the blog yet, I was still deciding what I wanted to do or if I was going to do anything at all. After sorting through all the cards and laying the framework for my spreadsheet of recipes, I opened my journal and started to sketch the box. Then I pulled out colored pencils and added some color to the page. I wasn’t particularly happy with the drawings, but it felt absolutely amazing just to participate in the act of creating. Roz, thank you for your constant inspiration and encouragement, it means the world to me. I owe you two chocolate cakes: one you can eat and one you can hang on your fridge. 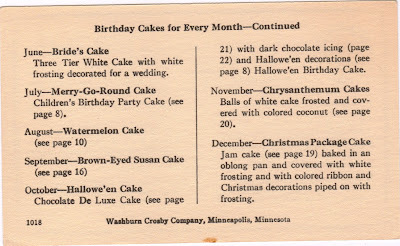 Perhaps the latter I will create this year while I wait for trick-or-treaters and put myself into a sugar coma while enjoying a piece of this decadent cake. I encourage everyone to find that activity that makes you more present in the world and makes you feel alive. It could be drawing, meditation, or even cooking. And I hope you all have someone like Roz in your life that will encourage you to keep working at it, even when you feel like you don’t have the strength to consider the idea. If you need some more encouragement to get going, I have a special recipe to offer inspiration that I’ll be posting soon. I hope it helps! 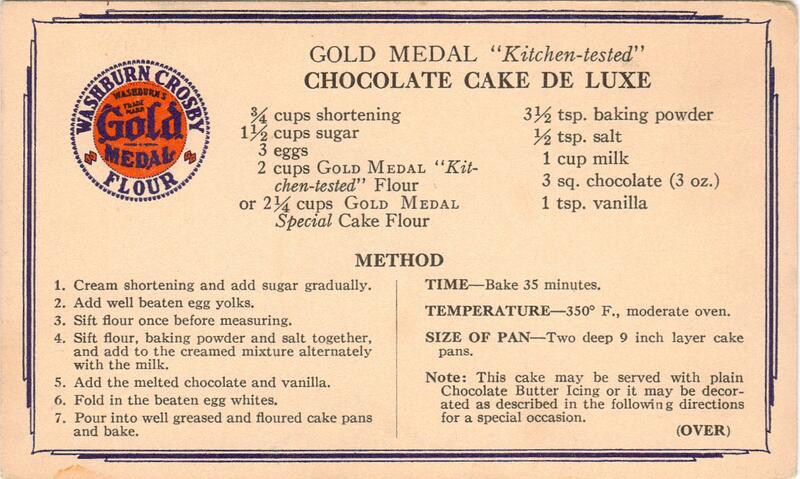 And if you need a little energy boost along the way, whip up a Chocolate Cake De Luxe. 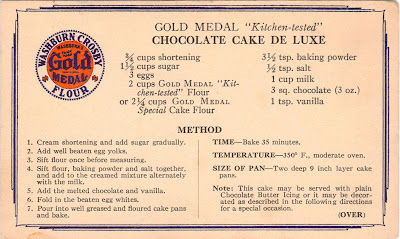 But I have to warn you, this cake should come with the same warning as alcoholic drinks – enjoy in moderation – because this chocolaty concoction really packs a punch! Even Murphy could smell that this cake is trouble!